The 90V10F module is a complete energy storage module comprised of 36 series connected individual supercapacitor singles of which nominal capacitance is 360 F.
MCE0010C0-0090R0TBI should be mounted with the bottom side down, and fixed with screw bolts through the hole on both side. The recommended screw is M8. The module is fixed by the positioning hole of four corners, and output by the terminal on the upper surface. Acorrding to different terminal or fixing position，MCE0010C0-0090R0TBI or customize model are available. 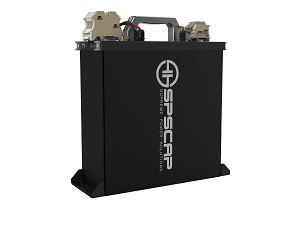 As energy storage capcitor, the gravimetric energy density of 90 volt capacitor module can up to 1.4 Wh/kg, strored energy can reach to 11.2 Wh.The 90 volt capacitor module complies with IEC 255-21-1 standard Specification for vibration and IEC 255-21-2 for shock. Besides the Environmental Protection is IP54. To avoid arcing and sparking the energy storage module should be in a discharged state and the system power disconnected during installation. The module is shipped discharged and with a shorting resistor. Shorting resistor should be removed prior to electrical connections. The terminal of the module is a terminal block. It should be connected with wire, and the recommended wire size is 6mm2. For the alarm function there is a terminal block, too. It has 4 holes, the definition of the holes is as following: 1 (yellow）、2 (green) ， over temperature alarm ;3 (red) 、4 (black) over voltage alarm. The 90 volt capacitor module includes cell balance voltage management circuitry which can protect each cell from operating in a damaging overvoltage condition. The module has the function of over voltage alarm and over temperature alarm, can be used in wind turbine, industry and micro grid energy storage.